Be the first to share your favorite memory, photo or story of Renea . This memorial page is dedicated for family, friends and future generations to celebrate the life of their loved one. Renea Smith, was affectionately known as "Doreen," was born December 2, 1949 in Elizabeth New Jersey. She attended Linden public schools all of her childhood life. In 1973, she graduated from Essex County Business School in New Jersey. After graduating from Essex County Business School, she began working for Union County unemployment office. In 1979, she began working for Union County Courthouse as a clerk typist. She was later promoted to principal clerk in the matrimonial and front office elections where she worked for 11 years. After leaving from the courthouse, she began working at Dock Resins Corporation. After leaving Dock Resins she found her true passion in life by giving back to the community she grew up. She ran the food bank at Heard AME Church where she was in charge of budgeting, inventory bookkeeping, and more importantly interacting with her clients who adored her. Doreen was known in the community through working at Manning's BBQ pit in Elizabeth and Linden New Jersey as well as Jeff's store in Roselle. She was a diehard Pittsburg Steelers fan and an abbot pinball player carrying one of the highest scores. Doreen accepted Jesus Christ as her Lord and Savior at a young age. She was a member of the First Baptist Church in Linden where she served on Missionary Board, secretary of the Women's Club, sang in the choir, served as an usher. She was also a past member of Sunlight Missionary Baptist Church in Newark were she was a trustee, choir member, and usher. Doreen was affectionately known as "Granny" to most and left imprints on the hearts of everyone who knew her. Doreen transition peacefully at home on August 22, 2018 in the presence of her loving family. Her mother Pauline "Polly," father Donald, sisters Deborah and Karen, and brothers Jeffrey and Donald Jr. preceded her in death. 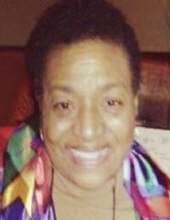 Doreen is survived by her daughter Katherine (Marc), son Richie (Teresa), her sisters Laconda and Lawanda, her brothers Kenneth and Kevin, her aunts Johnnie Mae and Caroline ("Tutta"), her grandchildren Shakeerah (Tahsheena), Hadiyyah (Anthony), Jazmine, Richie Jr., Donovan, Shanta, Jabron, Tra'Ana and Aliyyah, great grandchildren Lyric, Legacy, Iyana, Laiya, Tristyn, Taden, Taylen Asa, Jeremiah. Asa, Adrian, Braylen, and Jaiden, lifelong friends Joanne ("Cookie") and Evelyn, honorary daughters Denise and Shelley (Rodney), and many wonderful nephews, nieces, cousins, friends, and extended family. To send flowers or a remembrance gift to the family of Renea “Doreen” Smith, please visit our Tribute Store. "Email Address" would like to share the life celebration of Renea “Doreen” Smith. Click on the "link" to go to share a favorite memory or leave a condolence message for the family.